So far in my quest for creating new Voynich theory, based on my own biases, I transformed the 'zodiac pages' pages into map of Europe representing the situation in the Old World between 1400 and 1410 (time when Elizabeth of Nuremberg held the title of Roman Queen as portrait on the Teutonic Order chart) . It appears that the VMS is product of social mingling during increased diplomatic activities in Europe dealing with the Great Schism and the rise of the Ottomans. 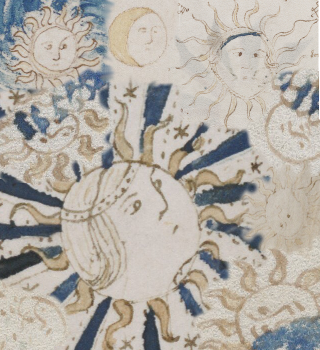 I assigned all the ‘zodiac’ symbols to countries from England all the way to the Golden Horde, but what about all the Suns and Moons that appear in the illustrations? The answer is found on the coats of arms of the Popes (and anti-Popes) that ruled during that time period between 1400 and 1410. As you can see, we don’t have to go to astrology to find celestial symbols in this time frame. It is the Sun Pope, Alexander V, who caught my attention. His name was Petrus Philargos (also Pietro Filargo and few dozen other spellings). He was known also as Peter of Candia (or Peter from Crete). His life story is truly unique and his missionary and diplomatic activities sent him all over the map of Europe. Born on Crete, he was found as a child with no family, begging from door to door, by Franciscan friar who educated him in the Venetian part of the island before taking him to Italy. Pietro’s education continued at Oxford and Paris. His missionary work included Russia, Poland and Lithuania. Pietro was sponsored by Giangaleazzo Visconti. Peter and his friend and secretary Decembrio supported Chrysoloras, ambassador sent by Byzantine Emperor Manuel II to spread the Greek culture in the West. Philargo was able to secure the title of Duke for his Milan supporter after mission to Bohemia. Soon after the death of Visconti, who made Pietro Archbishop of Milan, the future Sun Pope was created into cardinal (with Sun on his coat of arms) and in 1409 was elected Pope as Alexander V during the Counsel of Pisa. That worsened the Great Schism because the Moon Pope and the Rome Pope refused to resign. I was able to observe manuscript of Pietro di Candia from his lecture in Wien in 1393, held in Bayerische Staatsbibliothek. 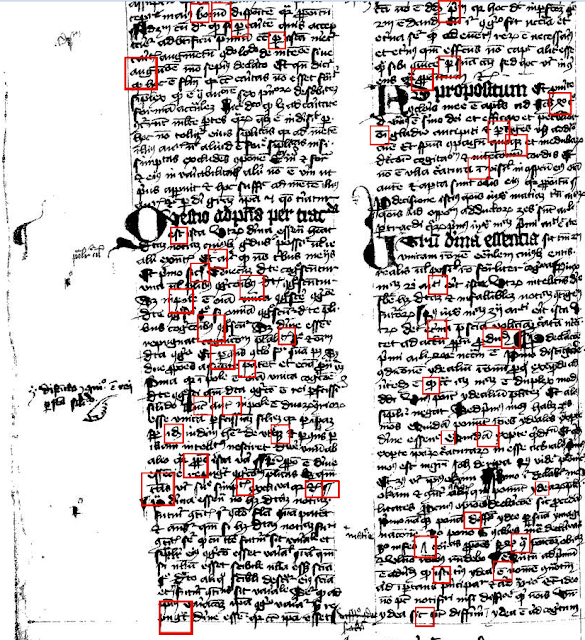 Couple of pages was enough to extract symbols very similar to the Voynich European Alphabet (EVA). 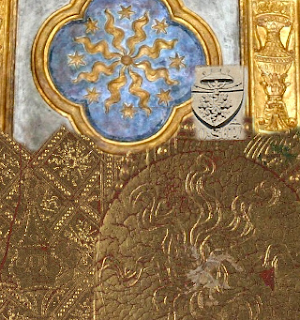 On top is Pietro’s manuscript; on the bottom is the EVA. Below is the sample page where the symbols come from. 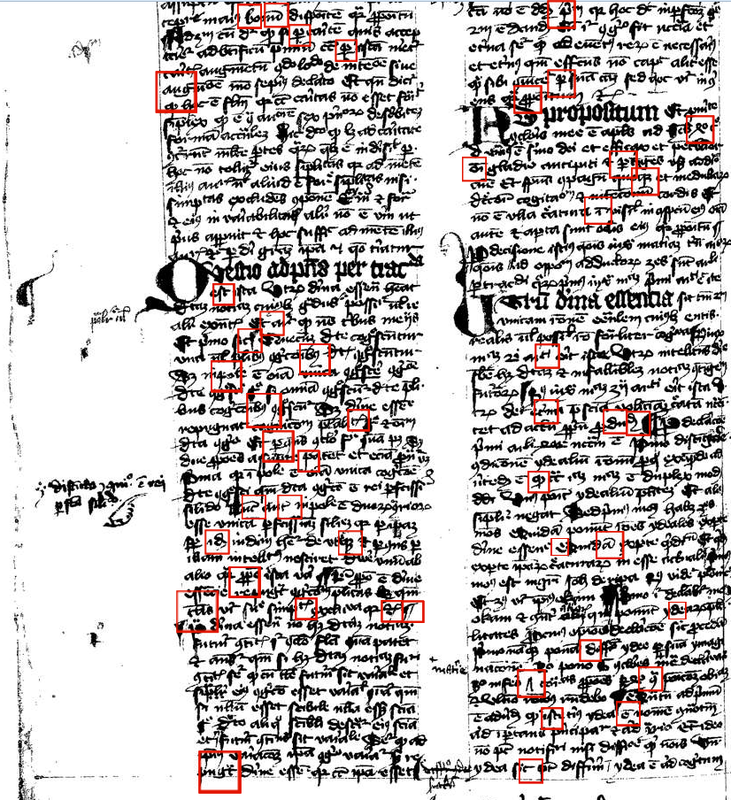 The manuscript appears to be written by more than one scribe. Some pages are neatly done (I would guess by Pietro’s secretary), some are messy, but rich and diverse in symbols (I would guess, the lecturer himself). Petros Philargos died eleven months after being elected Pope during visit to Bologna, where his tomb (decorated in the style of Visconti Tarot cards) is located. While browsing through the Cary-Yale Visconti tarot set I realized the game at the time was closer to the modern Monopoly than to exotic future-readers in smoky rooms with crystal ball and black cats. The cards at the time included money (coins) and weapons, only the goal was to conquer kingdoms instead of corporations.